Kennedy Space Center, Florida. 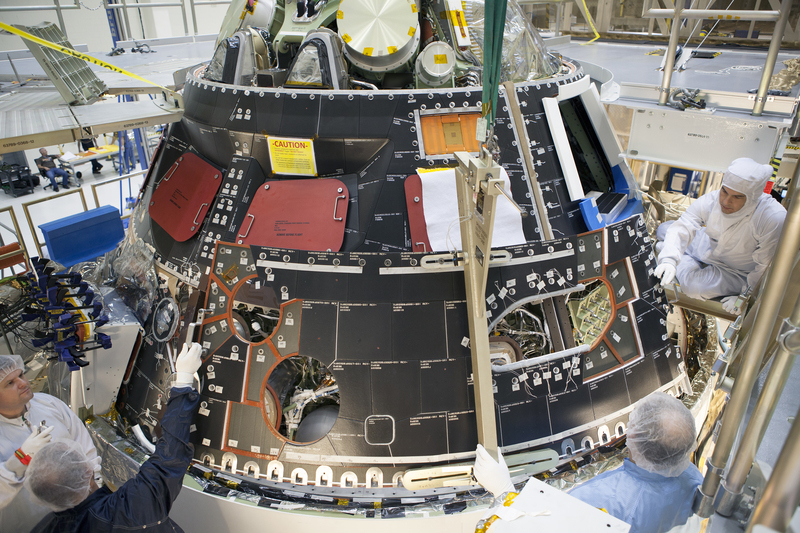 August 22, 2014 – Engineers and technicians at NASA’s Kennedy Space Center have finished installing the cone-shaped back shell of Orion’s crew module. 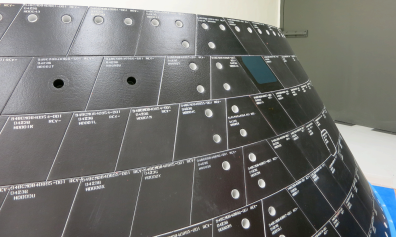 The protective cover is made up of 970 black tiles, similar to the tiles that protected the belly of the space shuttles as they returned from space. Although Orion’s heat shield will face the highest temperatures on reentry (about 4,000 degrees Fahrenheit on its test flight this December), the rest of the spacecraft will face intense temperatures as well. The faster a spacecraft travels through Earth’s atmosphere, the more heat it generates. The space shuttles traveled at 17,000 miles per hour, but Orion will be entering at 20,000 miles per hour on its first flight. The higher speed means that even though the hottest the space shuttle tiles got was about 2,300 degrees Fahrenheit, the Orion back shell could get up to 3,150 degrees Fahrenheit, despite being in a cooler area of the vehicle. In addition to studying how the tiles react to increased heat on the test flight, engineers hope to learn how to keep future Orion astronauts safe by testing for micrometeoroid orbital debris. Orion will be vulnerable to the regular onslaught of micrometeoroid orbital debris, which is too tiny to track and impossible to avoid in space. Micrometeoroid debris can do immense damage to spacecraft by punching through the protective tiles. Below the tiles, the vehicle’s structure doesn’t usually get hotter than about 300 degrees Fahrenheit, but if debris breeched the tile, the heat surrounding the vehicle during reentry could creep into the hole it created, possibly damaging the vehicle. Debris damage can be repaired in space with techniques pioneered after the space shuttle Columbia accident. A good deal of information was gathered then on what amount of damage warranted a repair. But the heating environment Orion will experience is different than the shuttle’s was, and the old models don’t apply. Engineers will begin verifying new models when Orion returns from its first flight test this December. Before installing the back shell, engineers purposely drilled long, skinny holes into two tiles to mimic damage from a micrometeoroid hit. Each hole is 1 inch wide and the depths vary from 1 inch deep to 1.4 inches deep. The two tiles with these mock micrometeoroid hits are 1.47 inches thick and are located on the opposite side of the back shell from Orion’s windows and reaction control system jets. A better understanding of the heating environment for damage on Orion’s heat shield will inform future decisions about what kind of damage may require a repair in space. Orion’s first flight test, called Exploration Flight Test-1, is scheduled to launch on December 4, 2014. This test will evaluate launch and high speed re-entry systems such as avionics, attitude control, parachutes and the heat shield. EFT-1 will provide crucial flight test data that can be applied to the design for future missions. Orion has only two flight test opportunities before astronauts climb aboard for the first crewed mission in 2021, so gleaning the maximum information possible from Exploration Flight Test (EFT)-1 in December (and later, Exploration Mission-1 in 2017) is of the highest priority.